Buy the CD here! Buy the MP3s on iTunes! 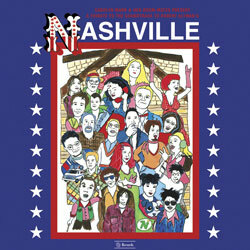 As a tribute to that amazing late '70s ensemble movie/musical Nashville by Robert Altman, Carolyn Mark and her Roommates, Tolan McNeil and Garth Johnson, recorded a bunch of her favourite singers including Kelly Hogan, Dallas Good of the Sadies, Neko Case, the Corn Sisters, Carl Newman of the New Pornographers, Cindy Wolfe of Tennessee Twin, Dave Gowans of the Buttless Chaps, and Robert Dayton of Canned Hamm. Corn Sisters-"On These Trouble Times"
Dave Lang-"For The Sake of The Children"
Dottie Cormier-"Tape Deck in His Tractor"
Cindy Wolfe-"I Never Get Enough"
Jean Mark, Dave Lang, Tom Holliston-"Elliot Gould"
Carolyn Mark, Dave Lang-"One, I Love You"
Robyn Carrigan-"It Don't Worry Me"
Robert Dayton-"Let Me Be The One"